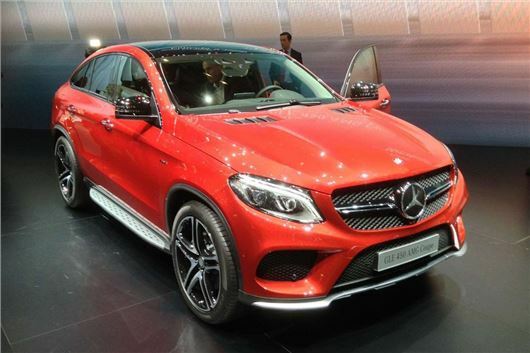 Mercedes-AMG - the performance specialist division of Mercedes-Benz - has unveiled its latest creation - the GLE 63 Coupe. It has been shown at the 2015 Geneva Motor Show ahead of sales starting in the UK in June, with a £95,000 price tag expected. The new AMG model is aimed squarely at the BMW X6 M, and is powered by a 5.5-litre twin-turbo V8 engine with 585PS and 760Nm, enough to propel the enormous slope-backed 4x4 to 62mph in just 4.2 seconds. For that privilege, GLE 63 owners will see a 23.7-mile return for every gallon of fuel they burn through (on average), and will be spitting out 279g of CO2 every kilometre. The engine is EU6 compliant, at least. Explaining the existence of the GLE 63 Coupe, Mercedes-AMG Chairman Tobias Moers says that "the new GLE 63 Coupe will inspire SUV fans focused on dynamics while at the same time representing a new interpretation of driving performance." A four-wheel drive model with an automatic gearbox, one of the settings of which is ‘Slippery’, the GLE has rear-biased power distribution so that it feels sportier than its general posture and dimensions indicate it should. It also features speed-sensitive 'Sports Direct' steering, which sharpens up accordingly in dynamic driving situations for a more engaging experience. Plus there's an AMG high-performance braking system. That said, Mercedes-AMG is touting the car’s "everything to everyone (with money)' appeal by emphasising its comfort features too, like speed-sensitive air suspension and a "dual-turbine torsional damper with centrifugal pendulum," which reduces transmission vibration. It’s big, fast, and comfortable, in other words. On the aesthetic front, the GLE 63 is distinguished from lesser diesel variants by way of an AMG styling kit, including quad tailpipes, black wing mirrors, and new front- and rear skirts.